NEW YORK (WABC) -- There's always going to be those fans who overreact to Week 1 in the NFL. That's not what this is. When the Giants improved their roster after an 11-5 season, there was talk of Super Bowl contention. But last night, this team's flaws were front and center for the entire league to see. A forgettable evening began with news that Odell Beckham Jr. would not play due to an ankle injury. That meant Big Blue was going to have to rely on new weapons like Brandon Marshall and Evan Engram. What those two players couldn't do, however, was block for Eli Manning. 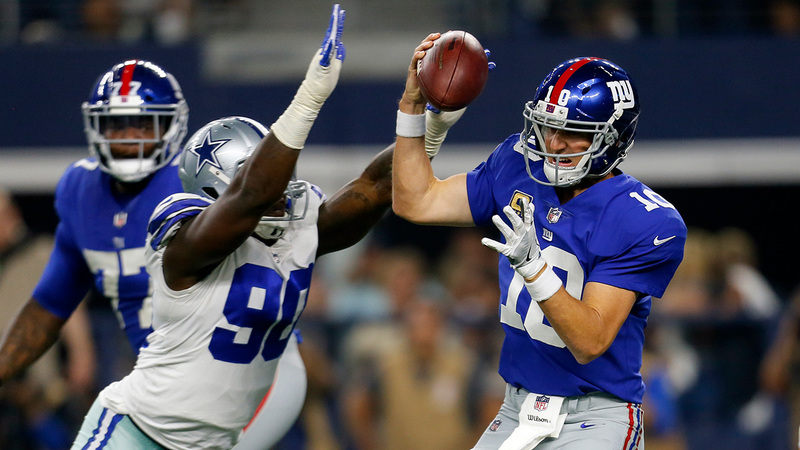 The offensive line left Eli out to dry the entire first half, and an issue that was ignored in the offseason reared its ugly head almost immediately. The protection was bad, but even Ereck Flowers can't be blamed for some of the throws made by Manning in the first half. He and Marshall were clearly not on the same page, and their lack of chemistry hurt the most on a key drive in the 4th quarter when Marshall was left wide open with room to run and Eli flat out missed him. The other side of the ball wasn't much better. Many players on the Giants defense talked about a squad that would be the best in the league. Instead, they gave up 30-plus yards to six different Cowboys receivers and watched Ezekiel Elliot impose his will all night. Bottom line -- despite all the headaches he may cause off the field, Sunday night proved the Giants need Odell Beckham. He's covered up many of Big Blue's shortcomings in the past, and he'll have to do it again if this team is going to contend this season. Beckham has made it clear he wants to be the highest paid player in the league. He might have proved he's worth it without even stepping on the field.